Yesterday the European Union, clearly in trouble in finding a single voice on how to deal with the current situation on Venezuela, emitted through some countries what was termed an "ultimatum" to Maduro. What I saw myself as a great tool form the EU generated a tweet storm of rejection that surprised me. Well, maybe not, the Venezuelan tweetosphere has become quite deleterious. Perhaps that hysterical opposition expects the foreign legion to land tomorrow to free us? So as a new public service I am going explain a few electoral details to understand the whys of the ultimatum details. It needs unanimity in its decisions, its great weakness; but its force when such a unanimity is reached. Fortunately when no such unanimity can be reached, there are mechanisms that allow for states to take positions, or for a scheme of unanimity with objection. That is, they all agree on a single declaration where the countries not agreeing can have a no objection way out. This is likely what is happening now (probably from leftist Greece and maybe one or two other governments). In short, the EU needs to work out a document that makes sure certain countries will not vote against, and so it can pass by less than 28 votes. This is not understood in Venezuela who cannot see why Europe is not as prompt to take side as the US and the Lima group did. Unreasonable comments bubble. It is very precise: Maduro has 8 days to call for new and fair elections, or the EU will recognize Guaido. Of course, the hysterical opposition claims that since Maduro is not the president then it is to Guaido to take over and call for elections. But Maduro has the guns, so far, a detail that too many are happy to forget. It means that Maduro has 8 days to find an exit from office palatable to all. The EU gives him a last chance to sit down and negotiate in good faith, delivering real tokens of seriousness. But just to sit down with the opposition Maduro would need to free ALL political prisoners and restore the constitutional powers of the National Assembly that the high court TSJ confiscated three years ago. What has Maduro to offer to prove his sincerity to encourage a negotiation? It is easy for him to deliver that: he just needs to call himself for an amnesty on all political prisoners and the TSJ just needs to rule on the case that has "justified" the annulation of the NA. The TSJ used the "illegal" seating of three representatives from Amazonas state because the electoral court had not decided yet on the validity of their election. Such an electoral court ruling should have taken place in no more than two or three months. Three years have passed, no ruling is out, and the TSJ keeps sustaining the annulation of the NA. The measure of the trick to annul an Assembly elected with a 2/3 majority against the regime is further proven with the electoral board CNE that could have on its own volition annulled the elections and repeated them. In any civilized democracy, dubious electoral results are dealt in a matter of months, not years. Thus a simple overdue ruling from the electoral court is all that is needed to validate the NA. Why can't Maduro offer fair elections? Because his regime would quickly unravel. For example divisions inside his party could suddenly become unmanageable if that dissent demands a primary. The narco-staff that support him cannot allow the faintest chance to be booted out of office. Etc. Can elections be undertaken, anyway? Yes and no. First there is the need of a political agreement. If not, Guaidó would be recognized interim president of Venezuela by all the countries that matter, probably even China once presented with le fait accompli and a guarantee of debt payment after renegotiation. And Maduro would crack down, or try it. But the big problem is elsewhere, the country cannot hold fair elections at this time. What is needed to hold elections in Venezuela? The Venezuelan constitution is ill written and demands that elections are held within a month of the installment of an interim president. Even in the best of times this is difficult since a presidential system needs some sort of primary and an extended campaign. Thus to hold a free and fair election there is the need of a political agreement that will suspend that constitutional agreement and allow the election to be held at least three months from. What needs to be fixed for elections in Venezuela to be fair "enough"? The electoral board is packed with Maduro supporters. At least 2 opposition representatives need to join the 5 member board to hold a veto on some decisions that could promote cheating. The electoral rolls should be revised. In the space of 3 months this is impossible. But at least the rolls of suspicious locales where Maduro got 100% of the vote and 100% participation should be audited. For the rest a good finger marking ink at voting time will have to do. The organization of the polling centers need to be seriously reviewed. First, the army should be sent outside in a strictly security role. Second, each political party that wishes to send witness should be allowed to, with its personal security guaranteed. Polling stations should be closed on the appointed time; they can only be kept open if there is still a line of people outside AND the party witnesses all agree on that, meaning that the LAST in line is established and monitored. This require time to train new personnel as the one in place are at least 90% government employees or dependents. ALL ballots should be counted, probably meaning that these elections shall be held through manual voting. Materially it is difficult to evaluate all the existing voting machines and their "connections" in three months, though the ones that can be verified may be used. The counting process rooms at the CNE should be transparent and allow for observers to enter to make sure voting result are not manipulated. Certainly extensive software verification and updates are required. International observation is a strict requirement. No serious observing agency will accept to come and observe an election if they are not granted a minimum of 3 months access to all aspects of the election, THREE months before election date. Since just negotiating the terms of the observation may take a month, we are faced with a lag of at the very least 4 months between the time elections are called and then held. Other type of "observations" as the regime like, and which they call "accompañantes", companions, are mere junkets. These people arrive a week before at best, are walked around on election day, meet 90% with regime candidates, and dare writing laudatory reports on how election day was calm and peaceful and fair the very next day. Since the Venezuelan system does not allow for a two round balloting, or an electoral college, there is a need to proceed to primaries. even though those could be very dangerous. The time lapse of 4 months imposed already by hiring international observation helps since there is a need for two months of primary campaign and vote and two months for general election. Currently the opposition has an extremely limited access to media. On air waves there is only one TV on cable network, of limited access to the general population and that is very selective as to which "opposition" is invited on its plateaux. Radio stations with free air waves can be counted on the fingers of one hand. Opposition press has been shut down through the regime monopoly on paper, giving it only to pro regime newspapers. Many internet pages are blocked. And internet is kept slow on purpose, or so it seems. There is thus a need to 1) erase the censorship office, CONATEL, 2) allow the media to have as many political programs as it wants, demanding at most that they try to find a balance between guests 3) free paper access to those newspapers that are now only on line but who could reopen circulation within weeks and 4) force media to reveal who are their real owners or risk suspension. Other mesures take more than three monts to be set in place, like fake news control. So we will have to do with the above listed which will be an immense improvement on the current situation. The constitution included the trap of forbidding political parties financing. One the regime was securely in place it used all the material tools of the state to finance its campaigns. Inasmuch as controls could be established it remains that an interim government cannot replace all the personnel. The only solution is stopping control of financing for the time being and let anyone for that that election get money from wherever. The Russians can finance chavismo, the US finance the opposition, it does not matter. At a later date the constitution will be revised to address that glaring problem. Of course the European union is perfectly aware of the problems listed above. The only way to have quick fair elections is to let Europe and other countries run the elections directly. Which they cannot do, nor a willing to do. The objective of that ultimatum is elsewhere, to force the regime to accept a transition government until the electoral system is recuperated enough to hold elections. We are talking a transition government that will need to take some serious and unpopular decisions. But both sides have gains as well as losses. The regime gain is that it can plan its exit. Those who can leave into voluntary exile/refuge have time to pack their things and leave before justice knocks at their doors. The regime also will force the opposition to share some of the unpopular decisions to be made, thus improving its electoral chances. Very useful, Daniel. Keep it up. Maybe I am recovering my Mojo? Yes, a glimmer of hope but, the LatAm countries MUST take the lead on this as everyone knows the US can do no right in LatAm. Also, I fear Trump will try and play this to his advantage to please his ego. I must say, I think the Spanish Legion would be a better choice than the French Foreign Legion to lead on the ground if it comes to that. Just as the future of Venezuela appeared most dim, and at your lowest spirit level as well, there it is... the door opens, and it's Sr. Optimism's smiling face. *the gold supply used to fund the military, while oil hasn't crawled out of its cratered price range has helped as well. What about the Gigantic Drug Trade? People don't mention that enough. China and Russia and Cuba get most of the oil; Drugs probably generate more money to BRIBE (not fund) the corrupt military and many others. I still do not like the EU's position even with your explanation Daniel. The EU put the power to call an election into Maduro's hands, no way around it they recognized him as the supreme power in Venezuela. Military support or not. They could have made the point clear that they do not recognize him as the leader and as such asked him to concede any control he has within 8 days such that a fair election could be called. The way it has been presented is in a manner of threat to the leader to call an election. Everyone knows Maduro and his handlers will not do this unless under their terms meaning a big waste of time that will end up with the country at the same point of control as it is now. Simply put you cannot empower Maduro then in the same sentence say do what we want or we will empower Guaido as this is saying Guaido in the EU's mind is not currently the rightful leader of the country. It has been a huge miss-step by the EU in my opinion. .. Certainly extensive software verification and updates are required." Heck, you'd have to call the Smartmatic techs.. Even their CEO, Antonio Mujica, admitted that his wicked little machines were seriously tweaked for fraud, to the tune of "at least one million votes in fraud" in a previous election, in his own words. BTW, the evil Rodriguez siblings were trained in such manipulations by Fraudmatic. It's hard to pick on Daniel's excellent, highly informative posts, but sometimes my critical mind can't help it. It is very precise: Maduro has 8 days to call for new and fair elections, or the EU will recognize Guaido. It means that Maduro has 8 days to find an exit from office palatable to all. The EU gives him a last chance to sit down and negotiate in good faith, delivering real tokens of seriousness." The second part here appears to be pure speculation or interpretation. To me it simply means that Maduro just has to CALL for elections, period. Does no have to "exit" or find any "palatable solutions". As far as I understand, all he would have to do is say "We are calling for elections today, to be carried out in one month (or whatever) while the CNE (and TibiBItch) get ready." Which is why I think it's a very dangerous and dumb thing to ask. Maduro could just "call" for later elections, gain some time, and commit another fraud, while the opposition loses momentum. Of course, if he did so, Guaidu and the rest of the world would laugh and oppose such simple "call" for elections. It's just a dumb request, unless I'm missing something. Well seems the stupidity in the EU recognizing Maduro to have the power to call an election has been pointed out to them. France has been tweeting that they meant Maduro has to let Guaido call an election or else. Just brutal on the EU to give Maduro the power to call an election in the 1st place. Next time simply say we do not recognize Maduro as the leader and if an election is not called for in 8 days we will back the constitutional leader Guaido. The U.S. is the key. Who cares about Europe. Money for oil no longer goes to Maduro. It goes to Guaido or it goes nowhere. Therefore he and the legislature control things. I'm not unknown I'm Joseph Andrews. I used to comment in the Guardian until they started to censor me after 120 comments with no problem. Why the fixation on presidential election anyway. The constitution was set up by Chavez to make presidency a personal dictatorship. Possibly constitution needs to be revised before another election. Elected legislature just needs to get to work. Start with offer of pay at levels of 1998 if they will support elected legislative branch of government. Then work with US for emergency credits for food imports to be paid with future heavy oil production. Give population cards we use for food stamps to buy food in stores at us dollar prices. Pay levels 1998 refers to military. Get rid of 90% of generals as economy measure. Unknown I partly understand what you are saying but how do you get there. Remember that the regime has been propped up by Russia and China and they would like nothing better then for the USA to stop taking oil making them the only choice for oil. They also use their ships such that the oil cannot be seized. Those generals you speak of are all corrupt and half of them are Cuban. The military further has spies throughout who pretend to dislike the regime to look for support against it. When they find it they arrest them. Result is it is near impossible for military at any level to communicate in opposition to the regime. I agree all countries opposed should designate all money including gold in Brittain as under the control of the truly elected national assembly. But remember also that for most part the regime loses money on oil production at current prices they make money and pay the military through drugs, printing money, stealing any real businesses assets and borrowing. Their hope is for mass exodus to have a more manageable populous base to the point where the economy can operate like Cuba. The one thing that has hurt them is that oil value is on paper only these days and forces in the world seemingly controlled by anti Venezuela have kept prices in check. Whatever happens a presidential election is a distraction from the real issues. I mentioned heavy oil since I understand that we are the only market.We also need to provide dilutent which is now plentiful. As someone who has suggested the current economic measures to influential friends some months ago I have to make the point that denial of money to those in power has a time limit. 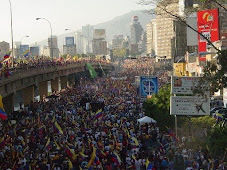 The clock is ticking and if Maduro wants to hang on while the people go hungry decisive actions would be necessary. It is extremely funny to read the comments and realize that these people really take themselves seriously. They think their opinions are not just the right opinions but the only right opinions. Of course our friend Anita does NOT take herself seriously. Dime otro de vaqueros.